Many of you in the T-shirt design world find yourselves looking for that one perfect concept – a design with that special something that catches on globally and launches you into extravagant T-shirt-selling wealth. For those of you who’ve watched “The Making of ‘odd guy art’ Part 2: The Designing,” you already know what a mentally-challenging and physically-taxing process T-shirt design can be. Sure, it’s fun; but sometimes “fun” can be fleeting when you’re faced with mounting bills and, in Graham’s case, an ongoing tea addiction. 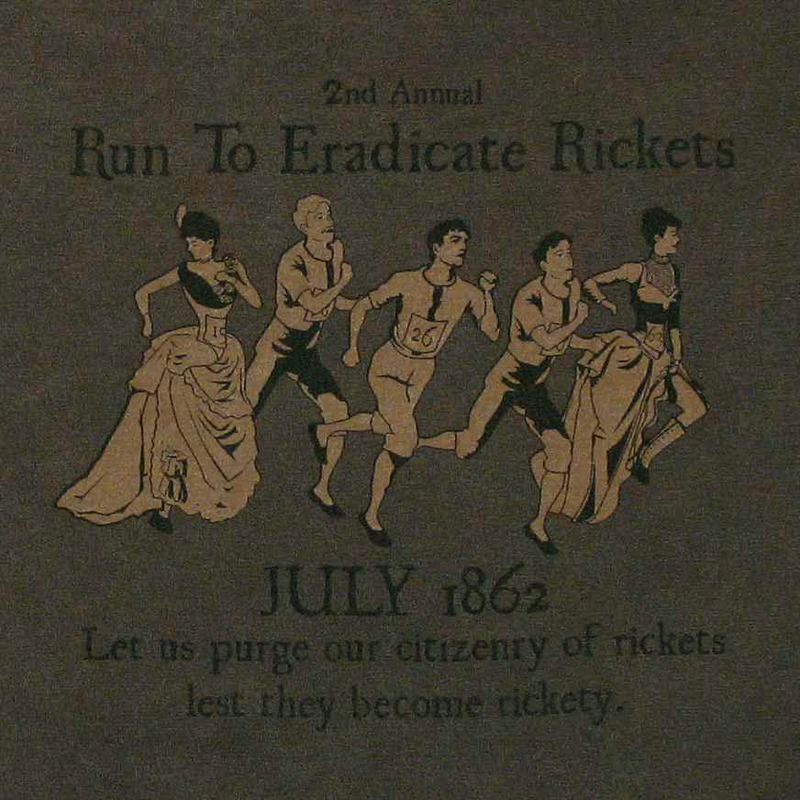 Plus, there are as many potential T-shirt options as there are people on the planet (6,894,185,175 as of press time). When faced with a blank computer screen or canvas, where does your inspiration typically come from? Take a second to click below and add your voice to this universal question! As we enter 2011, we are excited to feature two retailers who are now selling our T-shirts and caps. 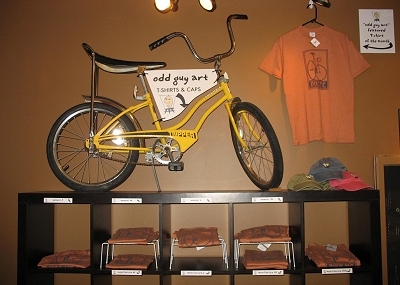 The photo above depicts our “odd guy art” display at Paradigm Coffee and Music (on 8th Street in Sheboygan). 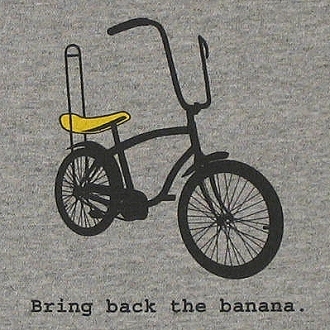 They are currently featuring our “Bike Me” design as their “Shirt of the Month.” Our 1970’s vintage banana bike adds more fun to the display and has been attracting a lot of attention. For those of you with an eye for old bikes, this is a Columbia Tripper. Paradigm Coffee and Music is a very popular coffee shop (with great food, too) that attracts nationally known musicians to its stage. 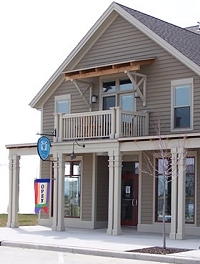 Resort along the Sheboygan River, you will discover “Aras, Beks and Pottiers,” purveyors of fine gifts. 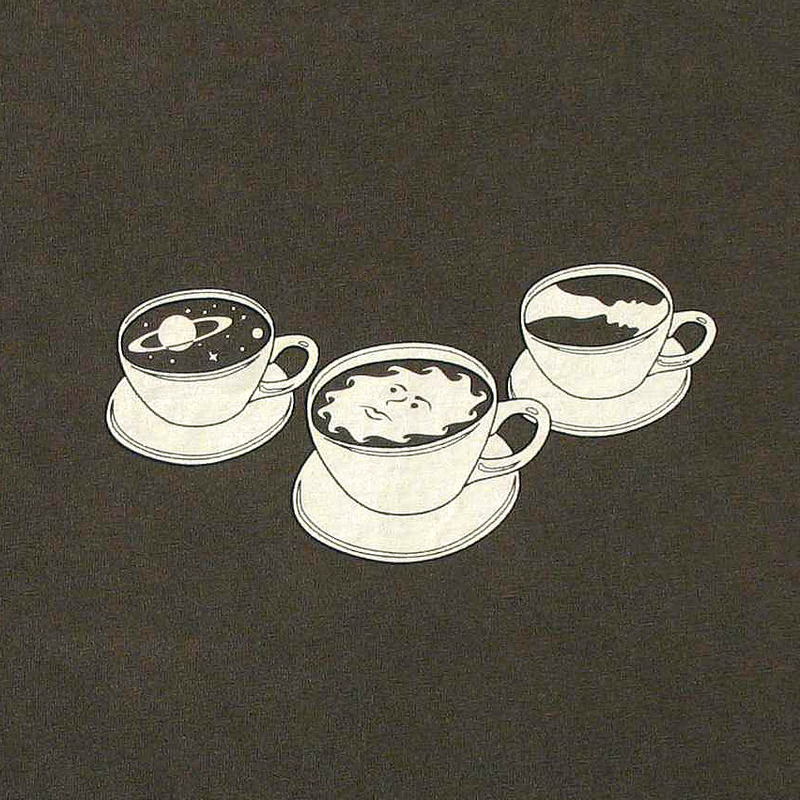 They currently stock three of our T-shirt designs. We are very happy to have our shirts included in this high quality gift shop in the centre of Sheboygan’s resort and conference area. Stop in at both when you are in town. You won’t be disappointed. Buy a shirt! We have several more outlets who are planning to stock our shirts in time for the spring season. We are excited to increase our growing number of retailers as we head into the new year. 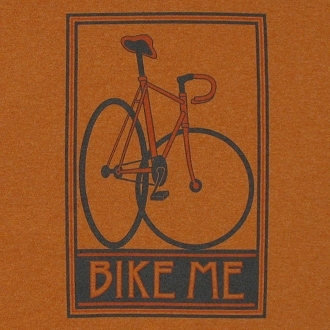 If you would like to see our shirts in one of your favourite apparel stores, gift shops, coffee houses, or bike stores – or anywhere – tell them about us (or tell us about them) and we’ll do our best to make it happen. Well, good morning! Come on in and make yourself at home. There’s some coffee over in the corner there and a blank easel for the kids to draw on while you shop. Ah, good question. 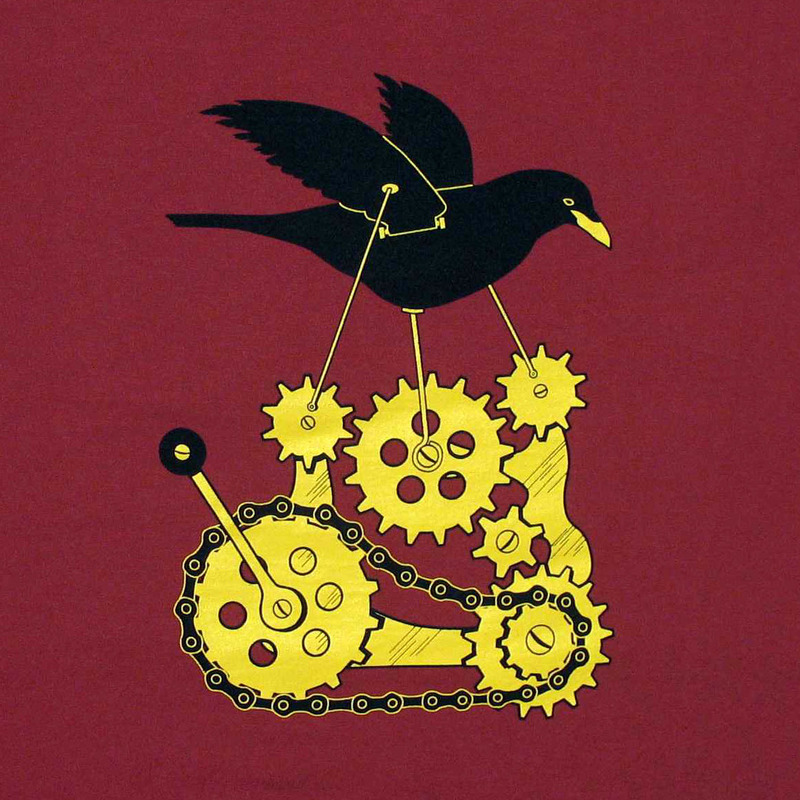 We mainly design and sell our own T-shirts featuring the kind of art we ourselves are drawn to; art that is odd or witty or cool. See this shirt here? 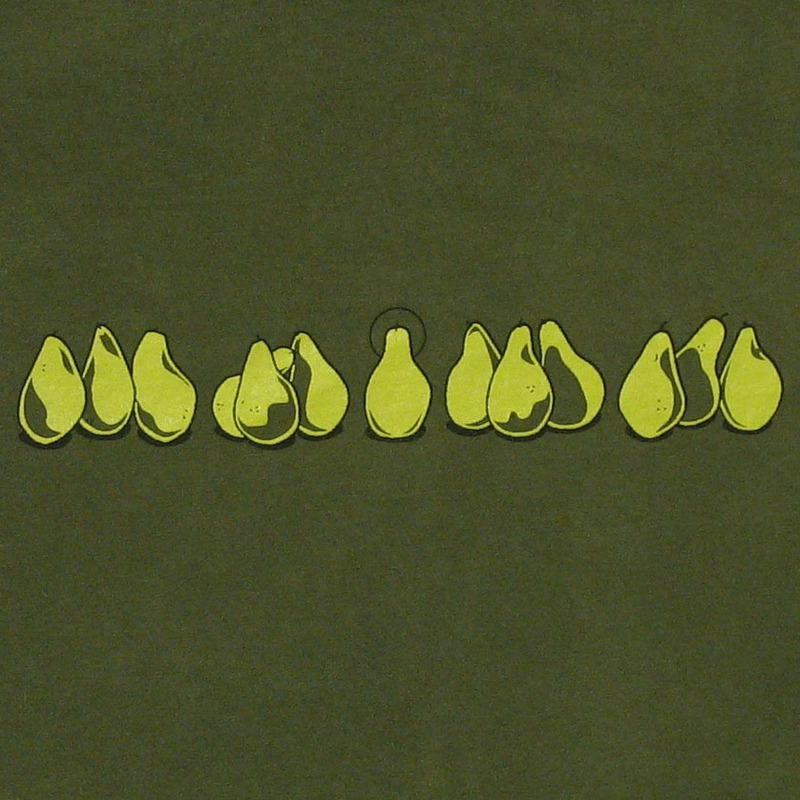 It’s based on DaVinci’s “Last Supper,” only it’s also a still life of pears. Like all our shirts, it’s screen printed on 100% cotton. Sure, you can try them on. The fitting rooms are over there next to the Monet. Go on. We’ll wait! Oh, I see the women’s cut is a little snug on you, sir. You’ll want to try the roomier Mens/Unisex style. All shirts come in both cuts. Our shirts are all pre-washed, so don’t worry about them shrinking. Have you decided on purchasing something today? (Pause). What?! You want one of each? Excellent, sir! Graham will ring you up back at the register (just right of the Renoir) while I refold your shirts and bag them for you. 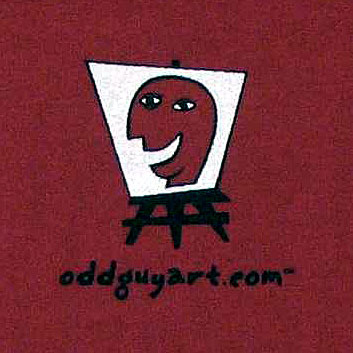 Thank you for stopping at “odd guy art!” Feel free to visit our online store. Dispatcher: 9-1-1. What is your emergency? Caller: Uh, I just can’t believe this. Dispatcher: How can I help you, sir? Caller: It’s completely crazy. How can they do this?! Dispatcher: Sir, try to calm down. Let’s take this one step at a time. Caller: But it’s mad! They can’t be serious. 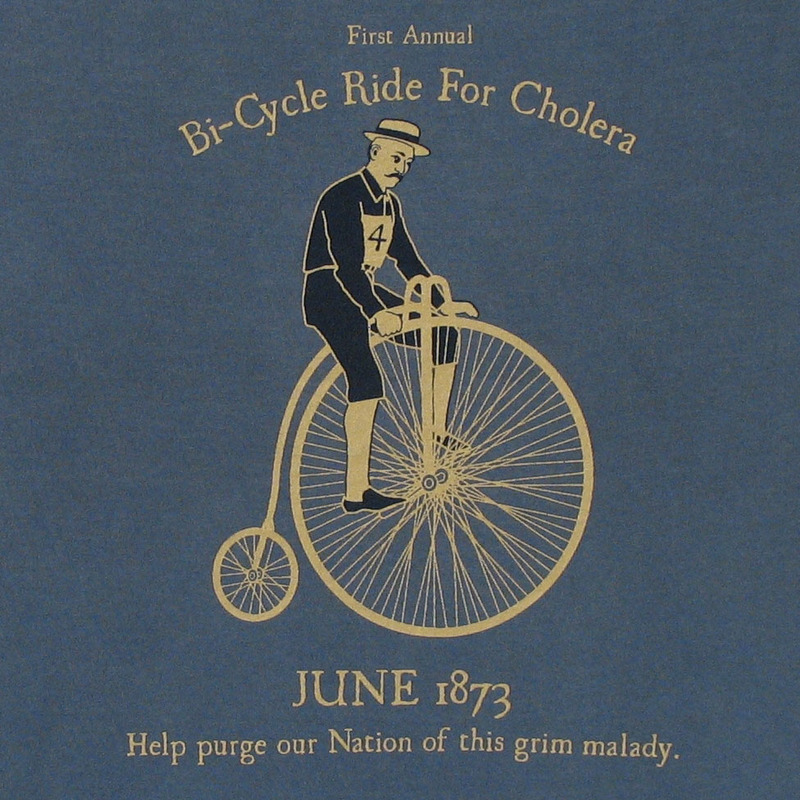 Dispatcher: You mean those witty, artsy, T-shirt people? Caller: Yes! Oh my god. I can’t breathe. Dispatcher: Ok, sir, slowly: Are they threatening you? With stylish shirts? Caller: No, no, it’s… it’s much worse than that. Dispatcher: Then what? What are they doing to you, sir? Caller: Fff…fff… free shipping! They’re offering me FREE SHIPPING! On EVERYTHING! Dispatcher: Sir, I need you to step away from your computer. Caller: Ahhhhh! Ok, I’ve let go of the mouse. Are you sending an officer?! Dispatcher: Heck no! I’ve got to get to oddguyart.com before their stock runs out! Back in college, I had an art professor who voiced an interesting theory: That a work of “art” should be defined by the artist’s ability to bring something into existence from his own imagination that did not exist before. 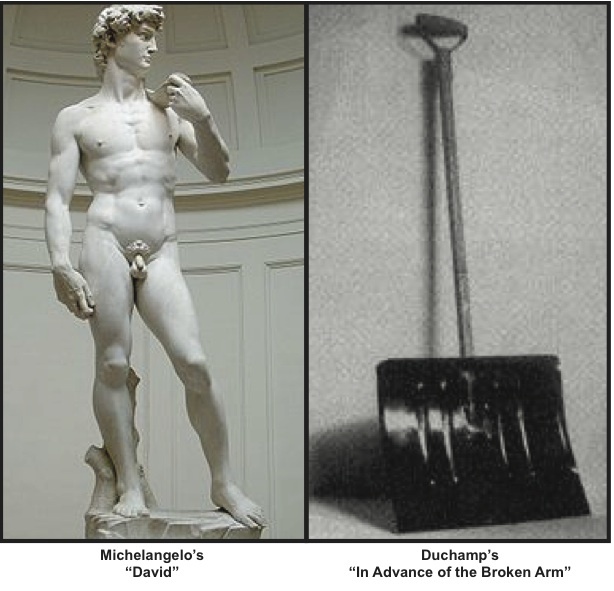 On the other hand, this professor continued, Marcel Duchamp’s store-bought shovel propped in an exhibit gallery corner and titled “In Advance of the Broken Arm;” now THAT was art. It represented, she said, a completely original idea depicting the artist’s “leap of faith” in considering an ordinary object with irony and humor. While I understand my professor’s intent (sort of), I can’t help but compare these two pieces of artwork and conclude that my professor (with all due respect) had sniffed too much turpentine. The skill and interpretation and knowledge and passion and GENIUS that Michelangelo utilized when creating “David” – who began as a 17-foot block of marble and who’s figure is so beautifully detailed you can see his VEINS – puts the store-bought shovel to shame. But I still struggle at times with how to define “art.” As an artist with a Fine Arts degree who also creates artwork on a computer, I often run into people who prefer to call me a “designer,” as if my work isn’t “real art” because it wasn’t created with a paint brush. I’ve heard this said about illustrators as well; even though there exists some utterly gorgeous book illustrations, they aren’t considered in the same league as what hangs in (or what’s propped in the corner of) a gallery. 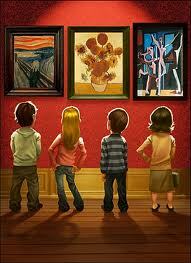 How do YOU define “art?” Drop us a comment and let us know. 1. How should you dress when making sales calls? 2. What is the first thing you should do when entering a store? 3. How should you present your merchandise to a potential buyer? c. Ask “why?” Repeat ad nauseum. We are purposely being elusive with the answers to this quiz so that you can reflect and ponder the kind of impression that “odd guy art” left with its customers. 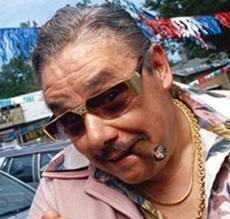 Good luck to you in all your sales! While a successful enterprise begins with a well-researched business plan, one must also remain flexible. 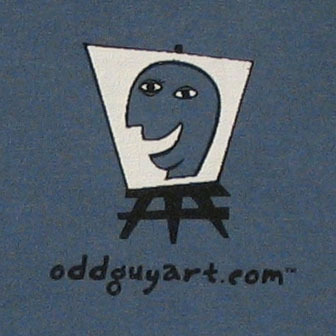 “Odd guy art” is no exception. 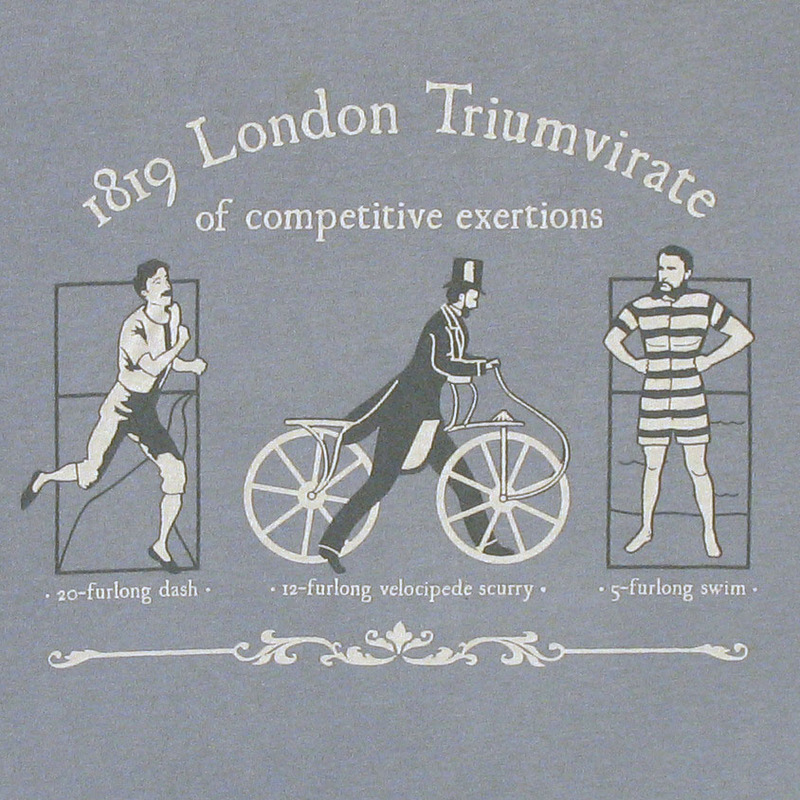 Our intent when we started this T-shirt design company was to rely solely on internet sales. But when we launched six months ago, we were immediately met with, well, cyber silence – despite months of research and prep and eager attempts at social network marketing. So we evolved a little. We designed a display stand and began selling at local events and outdoor summer markets. What a relief to see our sales take off! But we had to pack it up when summer came to an end. (If you’ve ever visited Wisconsin in the fall you’ll understand why we don’t sell our wares outdoors after mid-October). So we evolved again. We researched some more (we are nothing if not stat junkies) and decided to sell our shirts wholesale. So far, we’ve had great initial success approaching retail shops, so we’ll add those venues to our repertoire . 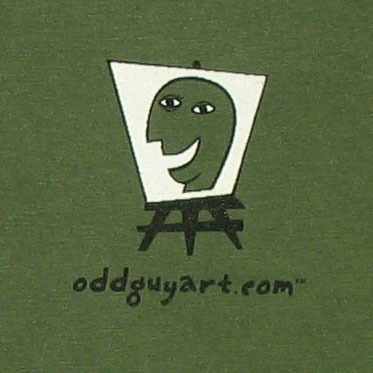 Though we won’t give up on internet sales (patience, Grasshopper…), we are very pleased with the direction that “odd guy art” has taken. Statistics dictate that a successful internet presence takes two years to achieve, after all, and we are happy to do all we can in the meantime to serve you.